Pitlochry is a very pretty town with its Scottish Baronial architecture incorporating towers and small turrets. It is quite the tourist destination, full of shops that cater to the gamut of shoppers, from the cheesiest of Scottish gimmickry to the finest of Highland woolens. Once a small stop on the road that was built by an English General in his effort to make access to rural Scotland easier after the Jacobite Rising in 1715, Pitlochry grew in importance and size after the railroad was built in the mid-1800’s. Queen Victoria visited the area in 1842 and stayed at Blair Castle, just to the west of the town; she spoke and wrote in her journals about the beauty of the Highlands and brought a lot of attention to the town. The railway followed in 1863. The easier travel route increased the amount of people who came to visit…and now Pitlochry has the Pitlochry Festival Theatre, an ensemble company that is the largest in Scotland. “Stay Six Days and See Six Plays” is a festival held each October that also incorporates the Scottish National Ballet Company which was founded in Pitlochry in 1960. That, and one of the largest Highland Festivals in the world keeps the town full of visitors for the month of October. Happily, we were there in September. Our destination for the night was to the east of Pitlochry in Kirkmichael, but what remained of the rest of the afternoon was targeted for a quick stop in the town and then on to Edradour Distillery. Knowing that we would want to have a longer amount of time the next day to do some serious shopping, we went directly to the Heathergems factory that’s located down a little alleyway off the main street. Heathergems are made from the stems of heather, which are sustainably harvested, dried, dyed, and compressed to make beautiful “stones” which are then set in various pieces of jewelry and other gift items. Heathergems began as a craft shop in the 1960’s and is the only place that makes these beautiful keepsakes which are now available at most Celtic Faires and shops. I have only purchased them from the factory shop in Pitlochry, my own way of keeping them as an extremely special gift. Edradour Distillery is another “absolutely must go there” place for me in Scotland. On our first trip, Kyle and I had been directed to go there by the owner of the Strathardle Inn where we had had a lovely stay. He was the one who set up a full-on whisky tasting for me in the Inn’s pub and then left me to discover the wonders of the whisky while he and his friends held a classical jazz guitar jam session. Set in white farm buildings nested in rolling hills along a small stream, Edradour is the smallest distillery in Scotland and has a rich history. The last survivor of a long tradition of farmhouse distilleries, its still is merely a quarter of an inch larger than the smallest legal limit. With an annual output of 240,000 bottles per year, the whisky is crafted in a way that is not seen in the larger Speyside distilleries that probably produce that amount in a week. I am certain that part of what makes Edradour Whisky so wonderful is the charm that the distillery exudes. It must get in to the whisky along with the spring water and the essence of the land in the malt. Thankfully, it does not leave the cask in the Angels’ Share, and instead gives the whisky a very warm, wonderful finish. 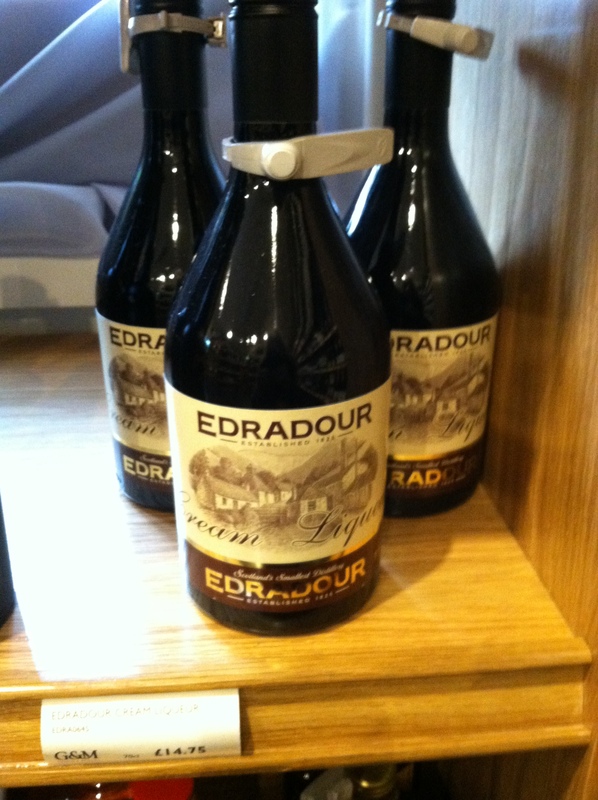 Our goal was to get our bottles of the Edradour Cream Liquer that can only be found at the Distillery. It had been far, far too long since I had last tasted it in the bottles I brought home on my last trip in 2006. One tries to make them last, but then what’s the point of having them, if not to enjoy them? Tour finished, tastes enjoyed, bottles purchased, and gifted souvenir glasses safely tucked away, and we were on our way out to Kirkmichael for our evening meal and our night’s stay. And, here again, change did not bring improvement. The Inn had been through two owners since my last visit, and it was clear that the present owners were not very well acquainted with what they were doing. Staying in Inn’s and B&B’s always has some familial feel to it, but these owners (a group of friends, it looked like) took it to new heights of lackadaisical attitude. When I made the booking, I requested vegetarian meals, and was informed that the owner (one of them anyway) was also a vegetarian. I was looking forward to the evening meal. And, it was completely disappointing. As was the room, as was the breakfast. Next time, I’ll track down the previous owners and stay wherever they are. The drive out to Kirkmichael, and back to Pitlochry, is one of my favorites. A very narrow, winding road flows over rolling hills that are laced with long stone walls and covered in sheep. Every now and then there is a hand-painted sign warning of the sheep in the area, and the lack of fencing restraining them from the road. Rainbows danced over the rich green pastures and the thick forested areas stood in the shadow of deep blue-grey clouds. We took plenty of time in the town to browse the shops and then I wanted to treat Liisa and Kyle to a St. Columba Latte: a wonderful concoction I had discovered on the last trip. Made with Columba Cream Liquer (malt whisky made with honey), it may have been the best latte I had ever had. Certainly the memory of it made it so. After describing the pub as I remembered it to a couple of women in one of the shops, I was directed down a side street to The Old Mill. How sorry I was that they now make their coffee drinks with an automatic machine (we’d seen them in various places along the way) and the Barista had no idea what I was talking about. Sometimes, change is really hard to take! We did take advantage of what was available: decaf, coffee, and hot chocolate; and sat in the glow of the wifi, catching up on things before we continued on our way. This entry was posted in Ancestry, Eco-travel, Ecology, Edradour Distillery, Heathergems, Highland Titles, Land trust, Pitlochry, Queen Victoria, Queen's View, Scotland, Scottish ancestry, Self drive Scotland tours, Travel, Uncategorized, Whisky, Women Writers. Bookmark the permalink.